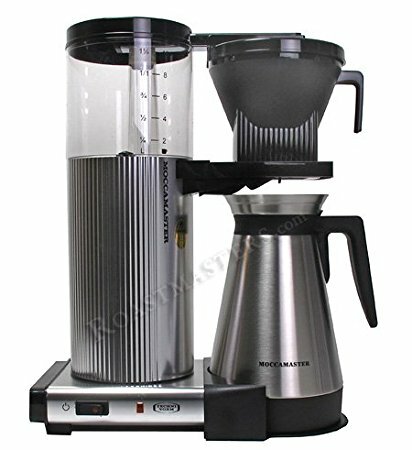 The Technivorm Moccamaster Coffee Brewer with Thermo Carafe is the king of all best tasting coffee makers and anyone who believes they really know their coffee needs to taste the coffee it makes. By optimizing the brewing temperature you are ensured a high quality brew every time and the hand made design ensure long lasting enjoyment. The Technivorm Moccamaster is a hand crafted coffeemaker that focuses entirely on the taste, texture and quality of the coffee it produces. This coffeemaker is designed for coffee aficionado, anyone who believes that coffee needs to be made perfectly and people who just enjoy a good brew. One of the most important factors of brewing a good pot of coffee is the temperature that the water is boiled too before running it through the ground coffee. The coffee is initially brewed at 198°F-205°F to ensure that the taste leaves the grind efficiently and effectively. The hot plate then keeps the temperature of the pot between 176°F-185°F fr ideal serving temperatures to ensure the second cup taste just as good as the first. The Technivorm Moccamaster is hand crafted in the Netherlands using only respected materials and advanced Dutch technology. This method of construction ensures durability and reliability for years to come and also limits the number of product defects. This slow but quality rich method of production has resulted in the Technivorm Moccamaster meeting the standards set by the ECBC, SCAE and SCAA. Being able to meet all these standards makes sure the user gets a delicious cup of coffee every time. Additionally, to make sure it stays clean the Technivorm Moccamaster is easy to dissemble. With all the parts separated you can clean your Moccamaster thoroughly which well help it stay in top condition for many years. The design itself is also flawless as the producers spared no expense on the Technivorm Moccamaster. They thought of things like making sure it is very easy to pour water in the reservoir and that you can plug it in from pretty much anywhere in the house thanks to it’s four foot power cord. Simply said. the Technivorm Moccamaster brews such delicious coffee and that makes it totally worth it for anyone who takes their coffee seriously. The hand made design makes the machine easy to use since they thought of just about everything and makes this coffee maker a long time investment. With proper maintenance you will be able to enjoy the Technivorm Moccamaster for years and years to come, enjoying delicious coffee every day. Lastly, the fact that its a smaller company that takes pride in their work you can always expect replacement parts and good customer service should anything go wrong. All in all I can highly recommend the Technivorm Moccamaster not only for the high quality coffee but also the smart and efficient design.